WIBW is the dominant station in Topeka-- when I worked in the studio there, I found out we had viewers who had been watching for nearly 50 years. WIBW signed on November 15, 1953, and it didn't have any commercial competition until 1967. Before 1967, WIBW held all major affiliations, with CBS being the primary. As late as 1983, WIBW-TV aired some ABC programs. Capper Publications (of the Topeka Capital Journal) owned the station, and persuaded the FCC to make Topeka its own market. Stauffer Publications bought WIBW in 1957. In 1963, the transmissioner tower moved from the station's Menninger site to 15 miles west of Topeka. During the Topeka tornado of 1966, WIBW-TV anchorman Bill Kurtis made his broadcasting career by providing real-time updates of the tornado's progress through the city. His phrase, "for God's sake, take cover" remained in use in promos up through the early 2000s. WIBW was Topeka's only TV station at the time of the tornado. Whizzo the Clown moved to WIBW in the 1970s, ending a few months before the death of the actor who played Whizzo in 1987. In 1972, WIBW-TV began using live weather radar. An ENG truck followed in 1982, and a satellite truck joined the fleet in 1989. Upon a merger with Morris Communications, the company sold WIBW-TV to Benedek Broadcasting in 1996. In February 2002, WIBW-TV moved out of its old building near the Menninger Campus, and into a new facility on the northwest side of I-70 and Wanamaker. The old building caught fire in 2012. In 2002, Benedek filed for chapter 11 bankruptcy protection, so Gray Communications stepped in to buy Benedek's stations. 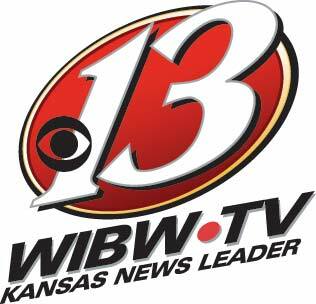 WIBW-TV signed off its analog signal February 17, 2009. WIBW-DT signed on channel 44 in 2002. It moved to channel 13 in 2009, but also operates a translator on channel 44. WIBW aired both My Network TV programming and Colours TV programs on the same subchannel for a while. As of 2011, the subchannel airs MyNetwork TV and Me-TV. In 2012, a knife-wielding man man attacked two employees in the lobby. On February 23, 2012, WIBW-TV launched local newscasts in high definition.